For the pre-menopausal women surgery would not be the first option of treatment. According to the type of cyst, it can also disappear on its own after nearly one or two months even without any treatment. If the cyst appears benign at the sonogram and does not cause harsh symptoms to the patient then it would be taken under observation for nearly two months. If the cyst has still not vanished even after the treatment and causes extreme pain to the patient then a surgery will be needed. In a few cases because of the cyst the ovary might even twist around which stops the blood from supply or it can also rupture the cyst inside the ovary. These types of cases are considered as emergency cases that need immediate surgery. However, if the woman gets cured by use of birth control pills, surgery need not be done. The way in which birth control pills work is such that ovarian cysts get cured easily. These pills regulate ovulation, thereby interrupting the pathways which result in ovulation. As ovulation gets obstructed, functional cysts do not occur. The cyst which had been present before would get resolved automatically as other hormones would not give any response. Birth control pills thus, prove to be an effective way for curing ovarian cysts. A basic surgery for treating ovarian cyst would include removing and draining the cyst or it might also require to entirely removing the ovary. Although the cyst might be very large it can be removed where the surrounding tissues would generally heal with just a minimal surgical repair. Most often a cyst can be so large that it can also destroy the surrounding area of ovary which makes it necessary for the entire organ to be removed. The doctor would also suggest in removing the entire ovary when the appearance of your cyst and your age put you at more risk of developing ovarian cancer. However if the doctor suspects cancer then it is vital to avoid rupturing the cyst and to release possible malignant cells in the abdominal cavity. In order to avoid this and save you from ovarian cancer the doctor will have the entire ovary removed. How would having ovary removed affect you? When size of your cyst matters only a single ovary would be removed . This will not considerably affect your fertility if you are pre-menopausal woman just because the ovary can produce enough hormones and eggs to become pregnant. However if cancer is the possibility then both the ovaries might be removed. When any surgery is done to treat ovarian cyst this is often recommended for the post-menopausal women. As the ovaries would no longer produce progesterone or estrogen in the post-menopausal women, the removal would have a little impact in the wellbeing of the woman. A few post-menopausal women have also reported loss of sexual desire or libido after ovaries are removed. This can generally be treated wit a low dose testosterone treatment. However the is s rapid testing of cancer cells done for the pre-menopausal women on the removed ovary prior to completing the surgery. When the doctor finds any cancerous cells then both the ovaries might be removed. The doctor would however discuss this possibility with you before conducting the surgery. The treatment for ovarian cysts also includes laparoscopic surgery. This surgery is basically conducted with the help of laparoscope which is an instrument with optic camera including some small instruments is placed in the abdomen with the help of small incisions at the pubic bone. An advantage of this type of surgery is that there are only tiny marks left on the patient's skin and the patient can also recover very fast through this surgery. This process of removing cyst from the ovary is called as cystectomy. The cyst is just like a bag that is filled with some liquid. Firstly, through an opening the liquid in the cyst would be aspirated through a laparoscopic instrument and then the remaining cyst is taken out slowly. The patient can leave the hospital the same day and would also be able to attend work just after two weeks or rest. The doctors are very careful during the surgery so as to leave as much as integral ovarian tissue as possible so that they can preserve the healthy eggs. In a few cases the ovary needs to be removed when the cyst grew too much and this destroys all the normal tissues in the ovary. As all these surgeries seem to work well in the treatment for ovarian cysts then can be a lot dangerous. You can however follow the holistic treatment which addresses the root cause of ovarian cysts and has also proved to be a successful treatment without leaving any side effects. Holistic approach can be referred to as the way of seeking treatment to inculcate a balance and live a better lifestyle. This approach, if applied in case of ovarian cysts, would create wonders. Holistic approach stands out from other forms of treatment such that it goes in to dept of the disease. It operates on the causes and not on the symptoms. 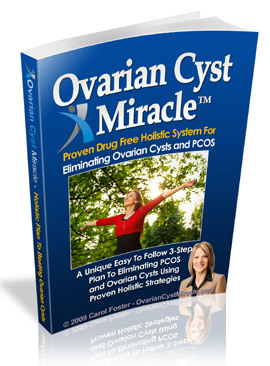 Following a balanced diet with respect to ovarian cysts is the first step towards holistic approach.